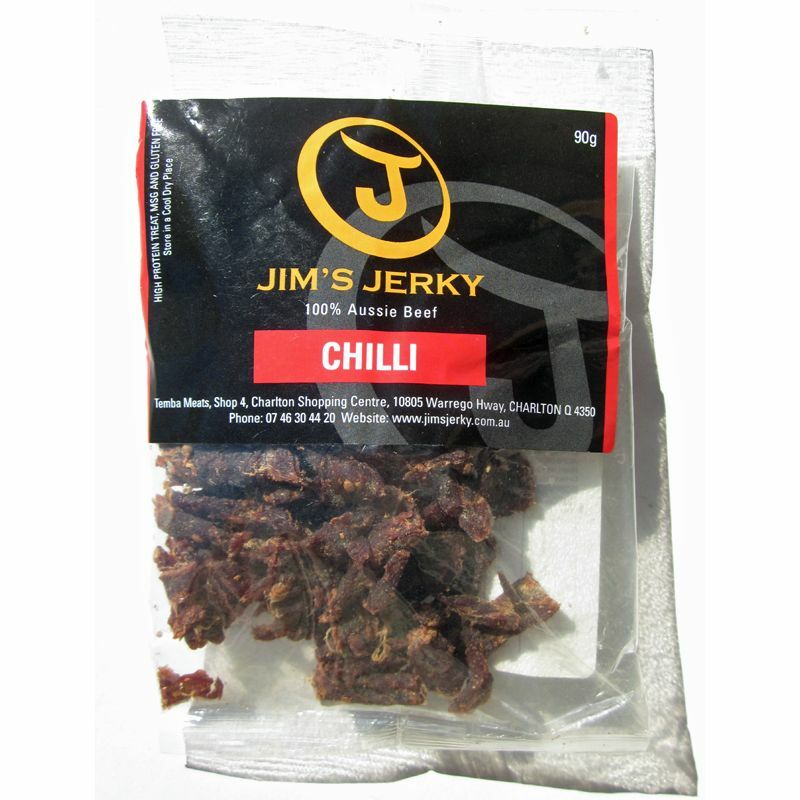 Next in the series on Jim's Jerky is this Chilli variety. 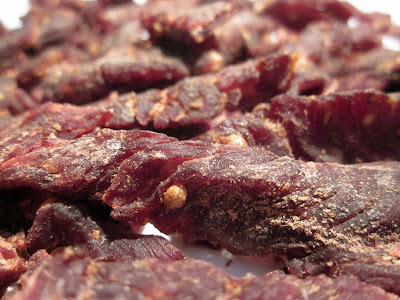 See my previous reviews of their Garlic Jerky and their Biltong. This Chilli variety is described by the company as "EXTRA EXTRA HOT", claiming it to be "eye watering jerky". The first thing I taste from the surface of these pieces is a light saltiness and a light bit of the coriander seed. A medium level burn comes in soon after. The chewing flavor starts with a much of the same, though with a light natural meat flavor. For being labeled as "Chilli" this jerky definitely holds up with the heat. After eating several pieces, I get a good deal of burn, what I would rate as hot (level 5 out of 5) on my personal heat scale. I eat a lot of hot foods, so I tend to have a tolerance for heat. But if you don't, this will certainly light you on fire. I'm getting a good rush of that capsaicin going through my bloodstream, and it generates a little bit of sweat from my scalp and a little bit of a runny nose. Except I'm not really getting any chile pepper flavor, just a lot of heat. Considering Jim's Jerky is calling this "Chilli" that implies to me the whole chile pepper, which is both the heat and flavor. Otherwise, what I'm actually tasting in this is largely the coriander seed. There's actually a lot of coriander seed visible on these pieces, and every once in awhile my teeth bite into one and I get a burst of that flavor. Aside from that, it's a moderate level of saltiness and then a very light natural meat flavor. 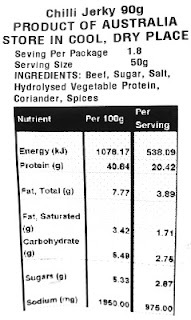 I pick up only faint traces of sweet despite the ingredients list showing sugar as having a high weight. 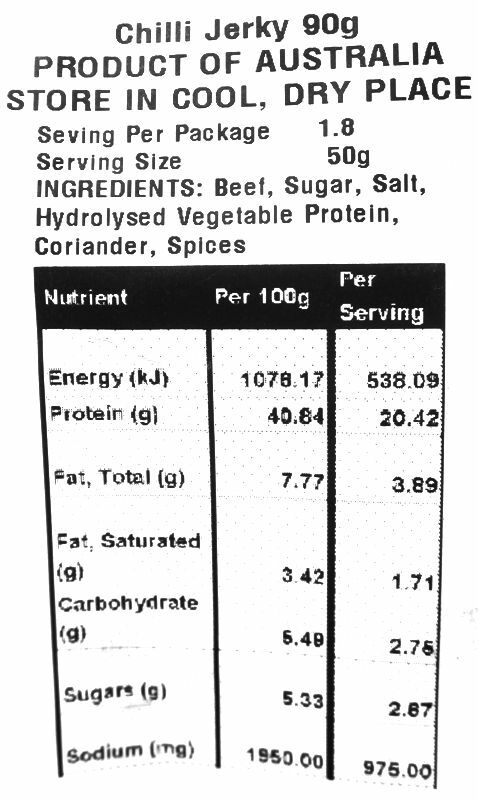 Overall, what you're going to taste in this is mostly the coriander seed with intermittent bursts, a moderate saltiness, and a very light natural meat flavor. You'll get a lot of chile pepper heat, but no chile pepper flavor. 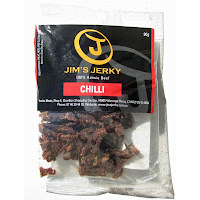 Jim's Jerky sells this Chilli beef jerky at a price of $40.00 AUD for a 500g package. That works out to $0.080 per gram. For general jerky snacking purposes, at the $0.080 per gram price, it seems to present a decent value. I'm getting an average amount of snackability due to a basic flavor boosted by that chile pepper heat and rush, an average chewing texture, though easy eating and good meat consistency. That price seems to be at the lower end of other Australian jerky brands I've found online, and it's only because of that lower price that it manages to offer some value. 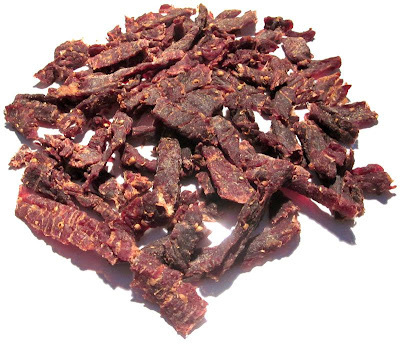 As a "Chilli" beef jerky, at the same $0.080 per gram price, it's a decent value. Even though I do get a lot of heat from this, I don't get any of the chile pepper flavor. Had Jim's Jerky simply labeled this as "Hot", it would be a much better value. But for me, "Chilli" implies both the heat and the flavor. This "Chilli" variety from Jim's Jerky generates a lot of burn, just as the company says on their website. I found it to be at that upper limit where I was getting enough of a scalding but without having to pause in between pieces. Hence, I could keep on eating and eating and allow the snackability to continue. But while this jerky dishes out a lot of heat, it doesn't provide any of the chile pepper flavor that I look for. And considering this was named "Chilli" I was hoping to get some of that. Otherwise, this tastes very similar to the company's Garlic variety I reviewed earlier, mostly that coriander seed flavor. That Garlic variety did not have much of a garlic flavor, and hence it seems to taste the same. But overall, I prefer this Chilli variety just because it gives me the rush you get when eating chile peppers. For my recommended beer pairing, you want something very light in alcohol so as to not exacerbate the burn any further. I'd go with a Boddington's or a Tetley's Ale, very smooth drinking, and should quench that burn.